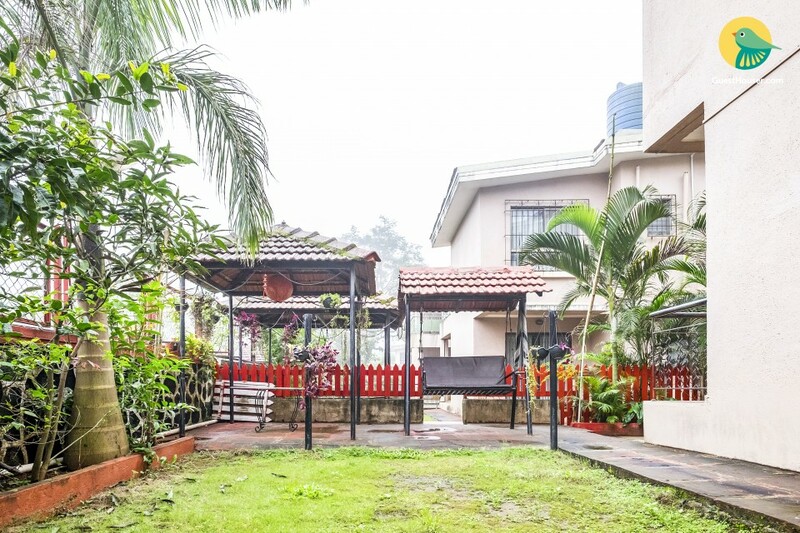 This is an offering of a three-bedroom villa, at a distance of 2.9 km from the famous Shree Narayani Dham Temple. The villa can accommodate twelve people and is an ideal option for large group stays. The accommodation is perfect for people who love travelling with their pets as the property is pet-friendly. The villa is surrounded by tall palm trees and has a well-kept lawn with a garden sit-out for convenience. A garden swing and a gazebo sit-out let you enjoy a hot cup of coffee, in all kinds of weather, particularly when there is a light drizzle. The living room is furnished with a comfy sofa set and a glass-topped coffee table for added convenience. A wall-mounted TV with external speakers makes it convenient for you to remain up to date with your favourite shows even while travelling! The kitchen is fully functional and equipped with a microwave, utensils, a gas cooktop, a water purifier, and a refrigerator to take care of all your culinary needs. 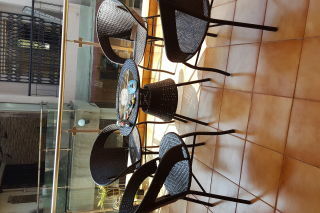 A round dinette is also available to make mealtimes convenient. 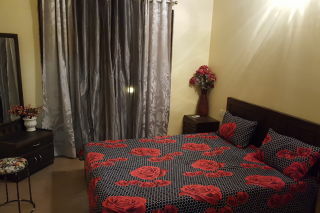 The bedrooms on offer are furnished with cosy double beds and dressing tables for comfort. 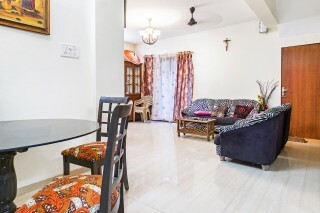 Ample windows ensure that the rooms remain well lit and adequately ventilated. The en suite bathrooms are well-appointed with western sanitary ware. Lots of side seeing: [ for kids n tourist ] Della adventure,Tiger point,Karla Caves , Parana lake , Lohadgad fort , lions point , Lohgrah fort , Bhaja caves , Tungarli lake , tigers leap , celebrity wax museum , Tikona fort , Kune waterfalls , Rajmachi park , Rajmachi fort , reversing station , Nagphani [dukes nose], Bushy Dam. ,from Monday to Friday we give 20% off except government holidays. I'm happy with my stay on this property but few things I faced which I wanted to write here. This is not negative review but but needs little improvement. PRONS A) Properly and interiors are same as displayed in picture B) Allowed 2 hours before of our actual check in time. C) Owner is good. CONS A) From this location you will not get any vehicle/taxi/auto to go to market so if you dont have your personal vehicle then you need to depend on to caretaker. B) Caretaker will arrange everything for you but he will give you bill with extra charges (He is charging lot more on MRP products too). C) At last when we about to checkout, caretakers behavior was suddenly changed and he became rude which is very bad experience at last when we about to leave happily and I was just going to give him tip but after this I did not give him a single rupee because of his behavior. Overall very pleasant experience. Only visit when you have your personal vehicle otherwise you will have lot to pay to auto rickshaw as they are charging minimum 400(two side) to go to market only. Hi there.. We had booked a villa called Galaxy Villas through another website and when we landed there, they had double booked and already had guests staying there. The owner who had taken our booking (and payment of 12000) stopped answering our calls and left us stranded in the middle of the road, with two young children. Thats when Guesthouser came to our rescue, we were able to find a different place, this particular villa. Made the payment and we landed up here. While the experience with the other villa left a bad taste, this house was the exact opp. The owner was extremely helpful and gave us the caretakers number. The caretaker maruti was also very helpful and we spent the weekend at this place. 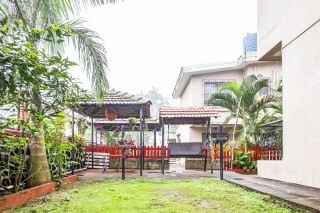 The house is very well maintained and in a very quiet part of lonavala. In spite of our bad experience in the other villa, we still managed to spend some decent family time, thanks to the owner and their caretaker of this villa. 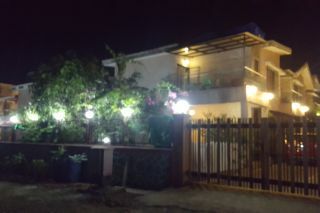 Its a very neat, spacious, clean and awesome place to be, the owner and caretaker and very humble and cordial, u also don't have many restrictions on noise. A advice to the fellow future guests would be to inform the caretaker to turn on the fridge prior to your arrival, you don't have ac on the hall room and the 3rd bedroom which is located at the ground floor. They have good security. It was pleasant experience, wish to be there again soon. 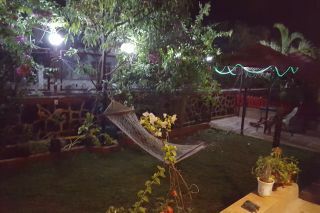 Nice bungalow, everything was neat and clean , climate was also pleasant in summer season especially night. Service is very good . it is closed to mumbai - Pune express way. Don't buy food at local khanawal , annapurna hotel is best for vegetarian food as well as amrapali and hotel mulaquat are for non vegetarian. I am highly recommending this bunlow for families enjoyment. We had booked this bunglow for the New Years. The host was really sweet to let us check in before time. Rooms are clean and tidy. The hall has a music system and speakers. 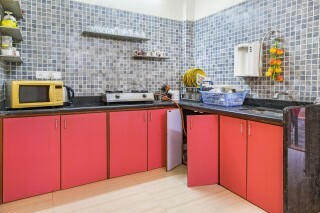 The kitchen is well organised and the care taker was helpful and friendly. It’s a steal deal and perfect for a getaway with family and friends! This one is pretty good. Only thing I wanted was a good view. It is quite inside of the main road near market. Had a good time. Owner has setup good music system. Caretaker was very helpful.